Most raspberry varieties are summer-fruiting producing fruit on the canes of the previous year but, called primocane or autumn-fruiting varieties, fruit in August and September. For a long time ‘Malling Jewel' was the most popular summer variety and it is still around. It is robust, tolerant of less-than-ideal conditions, resistant to virus diseases, and relatively early to crop in summer. Its lack of high yields is not a problem in a home garden. Raspberries do well in relatively cool climate and have been grown and bred in Scotland, many of the varieties having Glen in the name. ‘Glen Clova' was a very famous variety but is largely superceded by ‘Glen Moy', an early variety with large fruits of good flavour. ‘Glen Ample' is a vigorous, relatively new variety, mid-season, with heavy yields of large fruit, mid-season. It is spine-free, not that the prickles of raspberry stems are problematic. ‘Leo' is a late-fruiting, vigorous variety with large fruits of good flavour. ‘Autumn Bliss' is the best autumn-fruiting raspberry with good yields. ‘Allgold' is a yellow autumn variety. These can run out of weather in colder areas and in a cold wet autumn. Raspberries prefer full sunshine but can tolerate a little shade for part of the day. Shelter must be provided because the canes will be damaged by rubbing against the support wires. Plant about 30 to 40 centimetres apart and space rows about two metres apart. Raspberries can be planted against a wall, fruit being carried facing away from the wall. Raspberries are not particularly vulnerable to frost damage because they flower fairly late in spring and the flowers are well clear of the soil, but frost damage to the flowers can occur. Canes can be damaged too, at soil level, and frost pockets should be avoided. Good, fertile, well-drained but moisture-retentive, slightly acid soil is the ideal for raspberries and other cane fruits. ‘Well-drained’ is the key characteristic because the shoots die back in water-logged soil or heavy soil. Poor soil can be made fertile by applying organic manures and fertiliser. Limy soil is fine, as long as it is well-drained. The ground should be completely free of perennial weeds before planting. Raspberry canes should be supported by posts and wire. Use 240 centimetres posts, driven 40 – 60 centimetres into the ground, and spaced 6 metres apart. Fix three wires to the posts, at 50 centimetres, 100 centimetres and 150 centimetres above ground level. The canes are tied to these wires using soft jute string. If they are well cared for, raspberry plants will last twenty years or more. Weeds, especially perennials, must be controlled, by hoeing or digging out in the latter case. Feed raspberry canes in March, with 30 grams of general fertiliser per metre of row. Apply a mulch of well-rotted manure or compost in May, every year or every two years. If cane growth is poor because of poor soil, apply 10 grams of sulphate of ammonia to each metre of row in May. Pick the fruit when ripe – over-ripe fruit falls off the plant. Most varieties are summer-fruiting. Some varieties, such as ‘Autumn Bliss’, fruit in September/October. Each 30 centimetres of raspberry row will give about 500 grams of fruit. There will be some fruit in the second year after planting and full cropping is reached after five years. Die-back of canes without signs of disease can be due to unfavourable growing conditions. Raspberry rust causes orange spots on the undersides of the leaves. It does not do much harm. Although there is quite a list of possible diseases, raspberries are generally healthy. These cane fruits tolerate poor soil and tough growing conditions quite well – growing even a north facing wall. Blackberries are too vigorous for a small garden and they tend to carry fruit into September and October when it can be spoiled by rain. 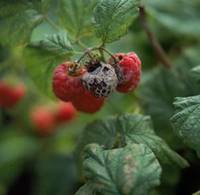 Training, pruning and feeding, and pests and diseases, are the same as for raspberries.